BC crankshafts are made from the finest, aerospace grade 4340 steel billet material the same material used in 7000+ horsepower Top Fuel drag. CNC machined on state of the art, 5 axis Mazak Integrex 300-IV CNC machines to exacting tolerances (.0001"). 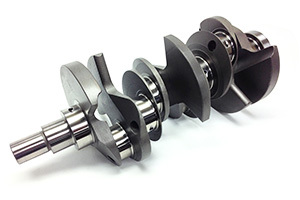 Every crankshaft features large radius journals that add rigidity for high horsepower, high boost, high rpm applications. Gun drilled, CNC ground oil holes feature a smooth surface for extra oiling, tear dropped for added oil scoop, cross drilled for priority main feeding to the rods and micro polished to a mirror finish for optimum bearing lubricity. All cranks are stress relieved, shot peened, magna flux inspected and nitrided (multi step heat treatment) for ultimate performance. Fully profiled counterweights are designed for reduced windage through the crankcase creating less oil resistance for better rpm potential.